You are here: Home / Creationism / Answers in Genesis / Young-Life Creationists—Who are the People that Believe they can Replace Darwin? Young-earth creationists (YECs) are actively promoting a radical new model of the origin of the diversity of life on Earth. (1) This speculative view borrows a number of elements found in any typical evolutionary biology textbook. For example, modern YECs claim that most and possibly all species alive today—except humans—are related to numerous other species via common ancestors (though they seldom use such language). They further claim that the act of speciation from those common ancestors has occurred via observable and testable evolutionary mechanisms such as genetic drift and natural selection (again, usually without using words like “evolutionary”). However, their version of the origin of species has several significant differences from evolutionary theory as commonly understood by biologists. First, they reject common ancestry of all species. Instead they promote separate common ancestry of large groups of species they call “kinds.” These are often asserted to be roughly equivalent to the taxonomic group of Family (though there are numerous examples where this scope is widened or narrowed). They accept that genetic variation is the raw resource necessary for species to adapt and speciation to occur, but vehemently reject the evolutionary principle that mutations accumulated over time are the source of meaningful variation (though they seldom if ever propose a reason why mutations cannot accomplish this). Instead, many YECs propose that useful genetic variation was supernaturally pre-loaded into the common ancestors of today’s species and expressed during the process of speciation (though again, the specifics of this mechanism are never clearly stated). Possibly the most striking difference between conventional evolutionary theory and the YEC proposal for the origin of species is the pace at which YECs believe that evolutionary mechanisms can create new species. YECs claim that species, at least initially after (and depending on who you ask, before) the flood, were created by evolutionary mechanisms very rapidly—sometimes within just a few generations. They believe the mechanisms of speciation have resulted in the formation of hundreds of thousands of new species in just a few thousand years. In contrast to this fast-paced origin of new species, conventional evolutionary theory has established that the process of speciation is typically very slow and usually requires thousands to millions of generations to produce entirely distinct species from an ancestral population. We can illustrate the profound difference between the YEC understanding of the origin of species and that of conventional evolutionary theory through the study of canid origins. Ken Ham and the Ark Encounter claim that all 36 extant (still-living) species of canids (foxes, wolves and domestic dogs) along with dozens of extinct species all evolved from a single ancestral pair—an Ark kind—in less than ~4,350 years. Evolutionary biologists studying the evolution of canids have concluded that all canids do indeed share a common ancestor… but no less than 12 million years ago. Even wolves and coyotes, which are considered “sister species,” meaning they diverged from a common ancestor relatively recently and are more closely related to each other than to any other species, have been separate species for over 1 million years. 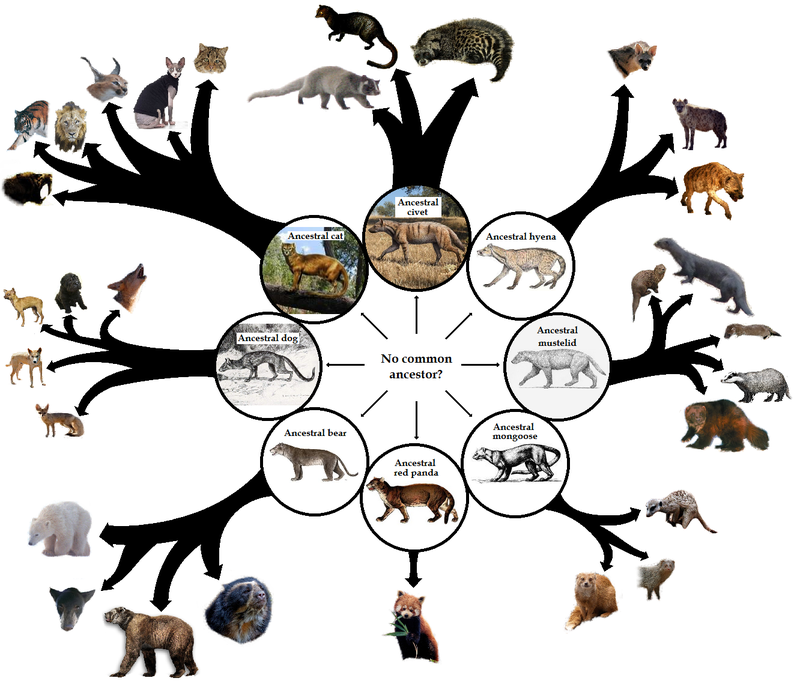 These conclusions are based on fossil evidence, geographic distribution, comparative anatomy and the observed similarities and differences in their respective genomes. 12,000,000 years vs 4,350 years equates to a radically different proposed pace of speciation, albeit with the larger number consistent with observed rates of evolution today. This is why the YEC model has been called the hyper-evolution or rapid-speciation hypothesis. Young-Life Creationist’ view of the origin of carnivores. The animals in the circles represent the “ark kinds” or common ancestors of the species in each kind. Each species has evolved from those common ancestors but YLC’s insist that there can be no common ancestor of each of these kinds despite the fact that the differences in each of these Ark kinds is less than that of the species within a kind in the present. Image created by David MacMillan for his article that explores Ken Ham’s increasing embrace of Darwin. The prominent (and de facto chief) YEC apologist, Ken Ham, has never participated in scientific research on speciation and maintenance of biological diversity (or, indeed, any scientific research at all) and so lacks first-hand knowledge of how the speciation process might happen. Why then are he and other young-earth apologists so convinced that extensive hyper-speciation has occurred recently and by natural processes? In small part (2) it is because he has placed his faith in the speculations and advice of his employees and a small network of scientists within the creation science community. Make no mistake, to suggest that two animals could have had descendants that would become every single individual of 40 different species of canids, including jackals, dholes, maned “wolves” and the many not-closely-related “foxes,” within just a few hundred generations is a radical claim. (3) I have not met a geneticist whose jaw hasn’t hit the floor when I explained that this is what YECs are promoting. I’m not saying it isn’t possible that thousands of geneticists could be wrong but extraordinary claims require extraordinary evidence, not scattered pieces of anecdotal evidence, conjecture and appeals to vast conspiratorial suppression of the truth. So who are these YLCs (Young-Life Creationists)? So who are the scientists in the position of providing extraordinary new evidence to supplant conventional biological theories? Put another way, who are the scientists providing Ken Ham and other YEC apologists with evidence that gives them the confidence to claim that a cat and lion or a gray fox and a wolf evolved from single pairs of common ancestors on the Ark 4,350 years ago? I have examined the past twenty years of publications in Young Earth Creationist journals including the Creation Research Society Quarterly journal, the Journal of Creation (Creation Ministries International) and Answers Research Journal (Answers in Genesis) in addition to several lesser known creationist journals (e.g. Journal of Creation Theology and Science Series B: Life Sciences). From those journals and popular articles on young-earth websites I have compiled a list of the authors of articles that have provided commentary, analysis, or research that have contributed to developing a young-earth view of the origins of biological diversity. We could call these authors young earth biologists (YEBs) or young life creationists (YLCs). I prefer YLCs because it stresses that all life and its diversity is young (i.e. has recent origins). These YLCs are de facto “experts” in the YEC movement who are shaping a six-day creation interpretation of biology. In addition to the primary experts, there are many others who have contributed articles on biological topics related to species diversity and their origins. However, most of these individuals have published just one or two articles and are professors at small Christian colleges committed to a young-earth paradigm. Most probably needed a publication for tenure or promotion and these creationist journals provide a sufficient outlet to show some research activity. Having followed the creationist journals for more than 20 years I have found this to be quite common. That leaves us with just a handful of young earth creationists that have truly devoted themselves to developing an understanding of biology in light of a young earth paradigm. How many are there? I have identified eleven individuals (Table 1) only half of whom have written explicitly about speciation and the origin of diversity of Ark kinds. (4) The number of papers that have been published in the YEC literature that propose any mechanisms at all for rapid speciation is less than a few dozen. The number that actually purport to test those hypotheses is smaller yet. Table 1: Twelve influential YLCs (Young-Life Creationists) along with information about their earned degrees, fields of study and current positions if known or applicable. Despite this very limited scientific foundation, Ken Ham and other YEC speakers believe that what amounts to little more than speculation by most YLCs is enough of a basis to confidently proclaim or insinuate that thousands of geneticists and evolutionary biologist are either ignorant of how organisms change and adapt to their environment or are willfully engaging in deception. Mainstream scientists have engaged in tens of thousands of research projects over 150+ years, testing dozens of mechanisms of species formation and adaptation including mutation rates, natural selection, genetic drift, epigenetics, etc… Yet, we are told that a handful of people who have little direct experience or even formal training in these fields can pen articles and find evidence that are then claimed to overturn all that previously collected wisdom (which is usually casually dismissed as a “lie,” though specific “falsehoods” are conspicuously unmentioned). One’s confidence in these scientists is misplaced if one believes them because they are providing answers that fit a particular biblical interpretation. None of the scientists listed in Table 1 have degrees in the field of evolutionary biology or from evolutionary biology programs. Of them, three (Tomkins, Wood and Sanford) probably were required to take a course in evolutionary biology as undergraduates. The others may have been exposed to evolutionary theory while studying other disciplines but were likely not trained in evolutionary theory by an evolutionary biologist. A couple of these young-earth biologists engaged in research projects that touched on some aspect of evolution theory but none of their dissertations involved testing evolutionary concepts. Only Dr. Wood has demonstrated experience with phylogenetic reconstruction (using DNA sequences to look at relationships of individuals or species) and has published work that shows he has a good knowledge of population genetics. Dr. Tomkins has the strongest background in genetics and has published a paper in an evolutionary biology journal. However, his contribution to that publication appears to be as a technician who did DNA sequencing and genome assembly and who was not involved in the evolutionary analysis. It does not appear he has ever directed any research that would require understanding evolutionary processes. Referring to these individuals as experts on evolutionary biology and taxonomy would be similar to asking an engineer to build a bridge only to discover that the person is a chemical engineer. That person would have some familiarity with some principles needed to design and build a bridge but you would probably not want to hire them to build your bridge. The point is that all of these scientists are obviously quite knowledgeable in some area of biology, having obtained advanced degrees, but that doesn’t automatically make them experts, or even competent evaluators, of evolutionary theory. I am a biology professor but there are many courses that we teach in our department that I would not be comfortable teaching myself. If I were asked to, I could—with some considerable effort—teach them at a sufficient level of competency but I would be far from having enough expertise in that field to lead a research program intent on testing the consensus theories in those fields. These individuals are seeking to be the founders of a biological revolution. They are claiming that thousands of biologists, past and present, who devoted their lives to understanding the causes and means of maintaining and producing biological diversity on Earth are utterly wrong. Despite their own lack of experience in the field of evolutionary biology they are certain that they have the answer. Some even act offended (see: Why don’t more people accept the young-earth view of speciation?) that evolutionary biologists won’t read their work or take their speculations seriously, despite frequently demonstrating a lack of understanding of the very fields they so vigorously critique. If these individuals desire to overturn knowledge acquired over 150+ years and replace it with a new understanding of how population genetics, mutations, genetic drift, and natural selection operate, they can’t merely have familiarity with evolutionary theory—they must be experts who have a firm grasp of all aspects of evolutionary biology. They need to have performed original research related to testing the many mechanisms of evolution so that they have intimate first-hand knowledge of the data and how evolutionary theory interprets that data. After all, one cannot hope to refute something that one does not even understand. I have written before about how important it is for YLCs to attend scientific conferences (A Challenge to Ken Ham: Send Your Employees to Professional Science Conferences) so they can understand what they are trying to overturn. I have also questioned how they review their own manuscripts in light of how few YLCs exist. What do you imagine happens when one of the above YLCs submits a manuscript and sends it to a YEC journal? It is unlikely that editors will be able to find a reviewer who has as much or more knowledge of the topic than the author. Most YLC manuscripts likely discuss topics which no other young earth creationists alive can fully understand and evaluate. The result are articles that contain many basic errors. It would be as if I didn’t have anyone else read my blog articles before I posted them. They will surely contain numerous grammatical errors or worse, because it is difficult to evaluate one’s own work. The academic world of young-life creationism is a small club. It is made even smaller by the fact that the members of the club are also part of rival creationist organizations that don’t always communicate well with each other. No doubt there are some exclusive clubs within the existing scientific community which study very specific fields. These small groups also suffer from some of the same problems in peer-review and group-think. However, evolutionary biology is not one of these areas. The network of scientists studying evolutionary processes is very large and any individual’s manuscript can be reviewed by multiple other experts with no personal connections to the authors. This is a “new model” for young-earth adherents. This is not an attempt to bring back an older, traditional understanding of the origin of biodiversity. Put another way, this isn’t your great grandfather’s beliefs. Instead it is an attempted re-synthesis of Darwinian evolution. It isn’t so much a replacement of Darwin but an attempt to edit Darwin. They want to harness the obvious explanatory power of evolutionary mechanisms and, yet, subject them to a vastly shortened chronology of Earth history. I say “small part” because YECs such as Ken Ham come to approach the problem of the origins of biological diversity already convinced that hyper-evolution has occurred because it is a necessary accommodation to their interpretation of scripture. Finding any evidence of rapid speciation simply acts as confirmation of their prior convictions. I think it is important to take note that an appeal to scripture for support of post-flood hyper-speciation does not provide the eye-witness testimony one would expect if such processes had occurred within YEC required chronology. The biblical authors never record observing a species giving rise to another species. In fact, the descriptions of animals in the bible (e.g. horses, foxes, dogs, wolves, ostriches, lions etc..) all appear to confirm that species that we see today are the same as they were then. For a more on the lack of biblical support for hyper-speciation see: Ken Ham’s Biblical Evolution–I have a book that says otherwise. For example, cheetahs, one of the more famous bottlenecked populations, are a single species that is thought to have been reduced to around seven breeding individuals about 10,000 years ago. They have extremely low genetic diversity—within a single population—to the extent that practically any cheetah can donate or receive a skin graft to or from any other with no immune response. That all canids have the same common ancestors supposedly 4,350 years ago yet exhibit no such homogeneity is beyond absurd to those with training in population genetics. Such a small number of individuals responsible for attempting to overthrow the collective wisdom of thousands of living and past scientists should in itself give one a reason to approach YLCs with skepticism. This is especially true when one considers there are hundreds of Christian biologists who have more experience and familiarity with the evidence than most of these 11 individuals and yet they find no merit in their biological proposals. Why have so few Christians with the experience to assess the evidence come to the defense of YLCs and not joined them in the revolution? In particular, a case could be made that Todd Wood and Peer Terborg breaks the general YLC mold. They have published a number of data-driven hypothesis-testing research papers (for example HERE, HERE, HERE, and HERE) which demonstrate a strong desire to test both his own hypotheses and those of other YLCs. I disagree with the conclusions of these papers but from what I know of Todd Wood in particular, he earnestly seeks to re-think the history of life from a biblical perspective while not fearing to allow data to question specific YEC hypotheses while maintaining core YEC commitments. The phrase “replace Darwin” is used by some YECs. I use it in the title of the post for that reason but I don’t think it is an accurate depiction of what they are trying to do. They aren’t trying to replace Darwin but rather they wish to edit Darwin as noted in Footnote 1. We should also note that YECs hold up Darwin as if he is synonymous with evolutionary theory but the latter has many more components to it than Darwin ever articulated or knew about. Thank you for this article and for Lars capturing something (although not the -only- thing – the damage to scientific integrity would be troublesome enough) that troubles me about the whole enterprise – providing another layer of alienation of thoughtful people from the Christian faith. I seriously doubt anyone has ever said, “Well, I’d like to become a Christian except for those wonky views on evolution,” so I don’t have any illusions that this specific issue is a line-in-the-sand barrier for people. But the assumptions behind it – a certain way of viewing the Bible, reading it, and using it – cover an array of issues. Further, the people this alienation probably affects most profoundly are Christians who are confronted with the evidence and feel like they have to make the choice that AiG is always trumpeting: either Genesis 1 and 2 is a literal, play by play account of the origins of life, or nothing in the Bible is true in any sense. There may be a few people out there who have become Christians because of AiG – people who are taken in by it. But my guess is that number is greatly overshadowed by inquisitive, thoughtful people who were made to feel they had to choose between the scientific evidence around origins and the entire scope of biblical truth and simply did what they thought they had to do. John Sanford is now living in western NY and is the Ratio Christi director at SUNY Geneseo. Thanks for the update. I didn’t now what he was currently doing. They call themselves a fellowship of scholars and scientists, and the group includes Austin, Baumgardner, Vardiman, Jay Wile, Paul Nelson, and others I’m not familiar with. Though I’m somewhat biased (as a partial contributor), I think this is one of your best in a while. Young-life creationists tend to view truth as a matter of authority rather than a proposition which corresponds to reality under scrutiny. Exposing the paucity of valid authority in those in whom they invest it may go further in helping them examine their views than any amount of evidence ever will. Joel (or Lars, etc. ): Have you read Nathaniel Jeanson’s 2017 book, Replacing Darwin: The New Origin of Species? Is Jeanson’s thesis inline with what you have articulated here? I have met Jeanson, and he is very intelligent, gifted, and articulate. My sense is that Answers in Genesis is grooming him to be the “go to” guy for “replacing Darwin.” If you are ever able to come up with enough time to write an extensive book review here on your blog, that would be really helpful. I’ve read Jeanson’s book. There is a chapter-by-chapter review being done by another blogger which really says it all and much better than I could. I will link to those when they are done. Personally, I didn’t find there to be anything new in the book to talk about that hasn’t already been said in his other writings. I agree the plan would be to have him be the point person who will define this new science. As far as I can see the book isn’t making much of any waves and what few there were are dissipating at this point. Regarding this post. I tried to outline the YLC view fairly broadly. I had to because there is a fair bit of variation of beliefs when you start getting into the details. I believe Jeanson’s ideas do fit within the general overview that I presented. Right now his position is that God created the original kinds with massive heterozygosity – built in genetic variability–and then natural processes which include mutations, but they aren’t allowed to produce any meaningful new traits, then produced all the species we see today. He allows for “kinds” to be quite broadly defined or in other words he allows for a lot of evolution to have happened though not as much as Kurt Wise/Todd Wood or Pensacola Christian College graduates (another story for another time). Thanks for the link. No doubt a smart guy who knows a lot. I’ve read a number of his papers but haven’t worked through that paper though I noticed he refers to his own papers for support which utilized Mendels Accountant for analysis. I’ve played with that program and its got its problems so I’m a bit skeptical. Either way, nothing all that surprising in the paper that I can see. How about I put him on the edge of the list with Wood. He understands a lot about some individual trees but frequently gets lost in the forest. Given that he proposes that deleterious alleles will invariably build up leading to extinction (which he calls “genetic entropy) in all populations, despite the obvious existence of short-generation-time organisms like insects and bacteria, suggests that his command of population genetics is not that great. @Lars. But Sanford’s entire issue is his belief in The Fall, which may not apply to bacteria and insects! Even assuming only vertebrates, some have generation times of a month or less. His calculations are mainly applied to humans (and are lacking in actual empirical data), but if applied to other organisms with short generation times, are easily falsified. Of course. I was just being snarky! Dear Natural Historian. I just released a three-part series in my blog (Google on IanDexterPalmer). One person walked out of Part 2: Deep Time, so I later visited her to seek rapport. As a young-earth believer (earth age 6,000 years), she explained that she didn’t trust the science of tree-ring and lake-varve dates which go back 50,000 years (a slam-dunk refutation of young earth of 6,000 years). And she felt like I was misinterpreting Genesis. We reconciled on a personal basis, which I am happy about. Otherwise my short-course was well-received. I’d be interested in your opinion of it, if you have the time. Hi Ian, that is really great stuff. If you don’t mind I’m including the link to your blog here http://www.iandexterpalmer.com/. BTW, I had come across your blog a while ago and I was reminded today when I tried to follow it with my email that your blog is returning an error when I ask to follow just now and the last time I visited. I wonder if Jeanson et al. are actually sleeper agents placed by evolutionary biologists, trying to make creationism closer and closer to evolutionary theory until Ken Ham is unknowingly endorsing evolution under the auspices of 1.4×10^12-Day Creationism (also known as Old Life Gradualistic Creationism). I haven’t been to the last few Evolution meetings, so maybe they put this plan together and I’ve just been out of the loop. The Evolution 2018 meeting is in my town this summer, so I’ll send you a private message if the conspiracy is happening or not. OLGC. I like it. Another acronym to add to the origins taxonomy. Seriously, though, Ken Ham doesn’t realize what he is espousing and if he every figures it out he is in for a big surprise. “Who are the poeple who think they can replace Darwin”….you ask. There is nothing in Darwins 1859 book (on the origin of species) in support of its grandiose title. How biological change functions to spawn novel species is frontloaded in the genome, in the part Darwinians coined junk DNA. Further, molecular biology demonstrates life is polypheletic not monophyletic. It also shows humans are characterized by novel Information not found in the great apes, in particular in the form of microRNA genes (man has around 800 unique microRNA genes), novel lncRNA genes. Further, we observe about 600 unique protein-coding genes. Read all my papers in JoC and you will get an undestanding of how life was created and how it is able to adapt via frontloaded (epi)genetic mechanisms, and mainly driven by TEs. Peer, so glad you commented. I am really embarrassed. I have a whole folder of your papers and have read or at least skimmed them all. I really don’t know how I managed to leave you off this list. I think I must have been conflating Wood with you when I was thinking about the TE model. It was a year ago that I was thinking about your VIGEs article when I wrote the other article you commented on but somehow forgot while I was writing this one. Really inexcusable when I had sorted though theses journals. I will definitely revise and add you to the list. You won’t be surprised that I don’t find the VIGE’s model very compelling but I will say the same things about it as I do Wood’s work, you are honestly working to make real/testable models and can see the problems that other YEC models have and aren’t afraid to point those problems out. It doesn’t appear that many of your colleagues have done a good job of listening which is unfortunate. You’ll see the VIGE first hypothesis is more parsimonious explanation for the Syncytin locus. Therefore it has scientific merit. Thanks , that’s an interesting paper. I had it in my folder but don’t remember reading it. It seems odd to me that AiG authors would barely reference these articles (maybe some remaining distrust from the break up many years ago? ) in their journal. These at least provide mechanisms rather than nebulous references to created heterozygosity. I still need to update my post to reflect your contribution. Thank again for pointing me to these resources again. I noted you now put my name in the list of Darwin doubters. That’s good. Btw, I have not commited myself to young or old creationism. I am simply a follower of Christ. I realize that Christ’s and Darwin’s teachings cannot be reconciled, and that we don’t need this reconsiliation, since there is nothing in Darwin’s (mostly stolen) ideas that is relevant to understand the great process of biological chance. Everything is deteremined by laws. Created heterozygosity is not a bad idea, however, but in my opinion is not required, since mutations are a function of DNA sequences and increased rates in Karela (due to increased background radiation) demonstrate this. The mechanisms are still to be discovered, although several have already been shown to involve DNA repair, chromotripsis, etc. Now you have added my VIGE first paper, I would like to ask you how you would scientifically defend your: “I disagree with the conclusions of these papers…”. I clearly showed in figure 2 and 3 of my paper that the most parsimonous explanation for the syncytin locus is two independent integrations of TEs. I Show that the scenario is much more likely than the Darwinian. So could you explain on what science your disagreement is founded? Thanks a lot in advance. In my opinion, evolution is modulated and predictable (if you know the rules). I appreciate the feedback here. I was tossing that out to emphasize what I think is a subset of YECs but I agree that there isn’t a need to proliferate terms and I’ve mostly refrained from using other than when I want Ken Ham to notice what he is doing to YECs.